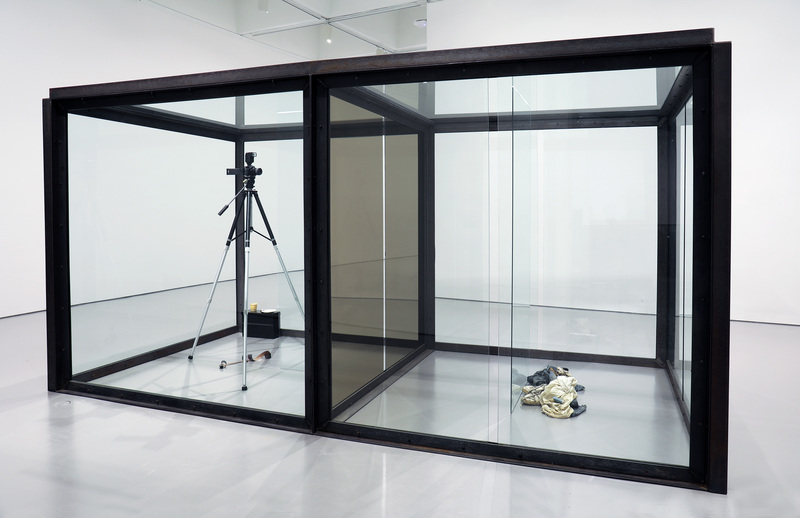 “The Asthmatic Escaped II” is made of two glass cubes, one of which has narrow openings that both suggest and deny access. Separating the cubes is mirrored glass, which, from certain angles, reflects the viewer, thereby “capturing” the viewer’s image. The Breakaway chocolate bar, the exposed film, and the pile of clothes with an inhaler suggest that the unseen subject of the work, the asthmatic, has escaped the perpetual prison of his disorder. According to the artist, the title refers to British painter Francis Bacon, an asthmatic who died in 1992, the year Hirst made this work.